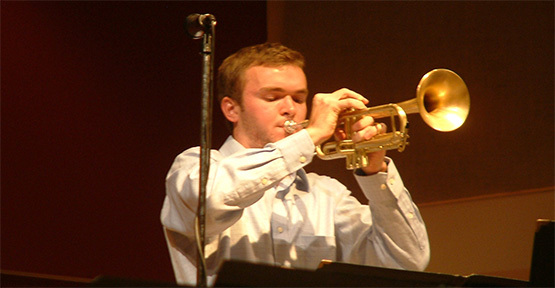 With a trumpet as his only companion, this summer Ross Eustis ’11 begins a 12-month journey around the world, including stops in five countries to explore the “Transnational Dialects of Jazz” as a 2011 recipient of a prestigious Thomas J. Watson Fellowship. Eustis, also a jazz arranger and composer, practices in some capacity two to three hours a day, whether it is playing the trumpet, composing music or listening to music. He is also a chemistry major with a 3.774 grade-point average, which, to an outsider may seem like a tug-of-war between two intensely different interests, and leave some wondering how he gets any sleep, dividing his time between and Hall of Science and the Hall of Music. But Eustis doesn’t see it that way. “Jazz and chemistry are similar because they share two fundamental things at the most basic level. You have to learn the language of each,” Eustis said. “In my Watson application, I compared learning a simple chemical reaction to how, in jazz, you need to know the harmony, the licks and the language. You spend so much time learning the language, mastering it, perfecting it and becoming fluent in it. It is all for the purpose of experimentation or improvisation. Last summer, while conducting research at the University of Hawaii for his senior thesis, Eustis began exploring the jazz scene in Honolulu. During his free time, he took his trumpet down to the jazz clubs and introduced himself to the musicians and before he knew it was playing gigs three or four nights a week. Back on campus, he worked closely with Keith Raether, director of fellowships and grants and coincidently a jazz enthusiast himself, on the application process. Several months of application writing and interviews paid off when on March 15, 2011, Eustis was informed he was a recipient. During his year-long trip, Eustis will visit Japan, Sweden, India, South Africa, Brazil and Cuba (pending a lift on travel restrictions), countries that he chose with careful consideration in order to provide himself with a broad view of the world’s jazz cultures. Eustis said he kept many factors in mind as he made his travel plans; he had to be mindful of seasons, natural disasters (such as the earthquake in Japan), politics and trying to secure as many contacts as he could before boarding the first plane. But only so much of a journey like this can be planned, and Eustis admits that he likely will find himself improvising bits of his travel just as he improvises on stage. Eustis is the fortieth Whittie to receive a Watson, joining the recent company of Aisha Fukushima ’09, who received the fellowship in 2009 to study "raptivisim," and Nadim Damluji '10 and Seth Bergeson '10, who both received the fellowship in 2010.